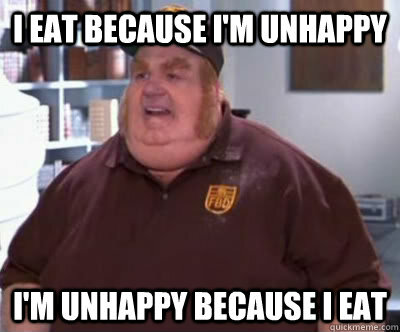 Seriously though, you don’t need to feel bad about distracting yourself with food. Some problems are so large and persistent that distraction could be part of the solution. It is, to paraphrase, empowering to acknowledge such fears and feelings AND OCCASIONALLY escape into the temporary distraction of food. In the same vein, it’s okay to feel bad at the realisation you’ve been using food to escape – ie. don’t feel bad about feeling bad. But yeah, I think you’re right. It’s a messy and difficult process, and expecting some kind of ideal, perfect solution just makes it harder. I found I had trouble with diets that say you can eat a certain amount but no more. I think the success of some diets (like the no-carb style of diet) is that it shocks us into a different relationship with food temporarily. But I’m the first to admit my solutions are particular to me. I know people who can easily limit their intake. The escapism of over eating that results in excessive caloric intake can be counteracted by another form of escapism that results in caloric outflow. I believe they call it “exercise”. For some (like me) it’s relatively easier to face the fear of physical exhaustion than the fears that arise from our existential situation. Indulging both gives you twice the escapism while also mitigating against any potential shame that is often elicited when a mirror is present! I too have heard of exercise, but it sounds a bit far-fetched to me. It’s also a bit of a rip-off! For instance, a chocolate doughnut could set you back about 10 laps of a sports field. When one adopts the dual-escapism model, as most exercise people do, the doughnut becomes so much less appealing.